Gatlinburg, TN is at the foothills of the Great Smoky Mountains National Park with the entrance to the park residing at the end of the main parkway. Gatlinburg is touted as a quaint mountain town since it is surround by the Smokies in all directions. 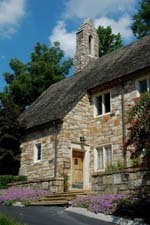 This location makes it a popular wedding destination as well. Only Las Vegas hosts more weddings in the US than Gatlinburg – not too bad for a “quaint mountain town”! There are shops and plenty of attractions to keep the entire family entertained. The city is known for being laid out for guests to easily walk the parkway, adding to the atmosphere. 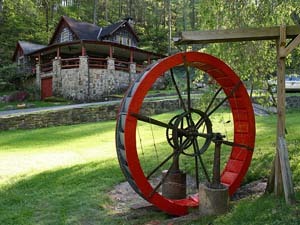 The Arts & Crafts Community speaks to the heritage and creativity of the area as you can watch artisans create everything from pottery to paintings. Gatlinburg provides a unique experience for all who come to visit the Smokies. Dr. John Burnett saw need for a settlement school in the area in addition to Pi Beta Phi’s in Gatlinburg. He raised $15,000 and purchased 135 acres for the campus. The campus was tuition free and the students preformed maintenance. 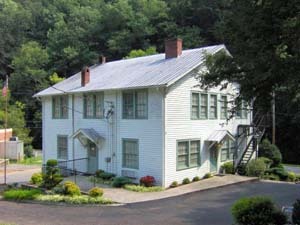 The Phi Beta Phi fraternity established the settlement school that operated until Sevier County took it over in 1943. The fraternity began to focus on the local product being produced in the area and began marketing the crafts, creating Arrowcraft which evolves into Arrowmont. 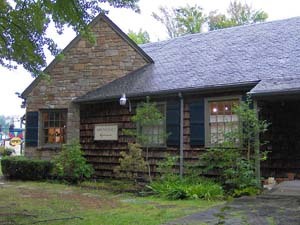 Today Arrowmont School of Arts & Crafts operates as one of the oldest craft schools in Tennessee. Designed by Charles Barber. Late Gothic Revival Style.